Denny Hamlin will climb into the #11 FedEx Express Toyota in Saturday night’s NASCAR Sprint All-Star Race at Charlotte Motor Speedway, the seventh start for Hamlin in the non-points exhibition event. One year ago, Hamlin started third and led 16 laps in the five segment, 90-lap race, but fell to 20th in the final 10-lap run won by Jimmie Johnson. Hamlin has recorded three top-10 finishes in six previous All-Star races, including career-best fourth-place runs in 2009 and 2010. He has qualified for the All-Star Race in every season after his 2006 rookie campaign (2007-2012) by virtue of race wins. This year’s field will again compete for the $1 million first place prize, with an additional $1 million up for grabs if a driver can win all five segments in the race. Qualifying on Friday night will be comprised of three laps on the track as well as a mandatory four-tire pit stop by the FedEx Racing crew. 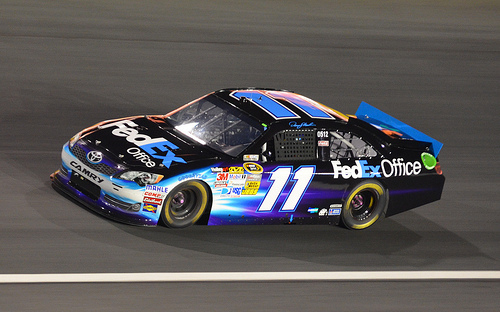 Denny Hamlin finished second in Saturday night’s NASCAR Sprint Cup Series race at Darlington (S.C.) Raceway in his first full event since suffering a back injury on March 24, crossing the finish line 3.155 seconds behind teammate Matt Kenseth in the #11 Sport Clips Toyota. Hamlin qualified sixth and ran among the leaders throughout the 367-lap event on the 1.366-mile, egg-shaped oval. Long green flag runs tested the FedEx Racing crew on pit road, and crew chief Darian Grubb made changes to the car to keep up with the track conditions after nightfall. In the end, the car was at its best for the final 30-lap run, with Hamlin following Kenseth to the checkered flag for the 1-2 Joe Gibbs Racing finish. Hamlin moved up four spots to 27th in the NASCAR standings following Darlington, 61 points behind Jeff Burton in 20th after 11 of 26 regular season races. This weekend at Charlotte Motor Speedway, the #11 FedEx Express Toyota will carry the letters ‘CLTR’ on the b-posts to recognize the Air Ground & Freight Services operations teams in the Charlotte market. What are your goals for the All-Star Race?